A dress and vest designed to go with these pigs. 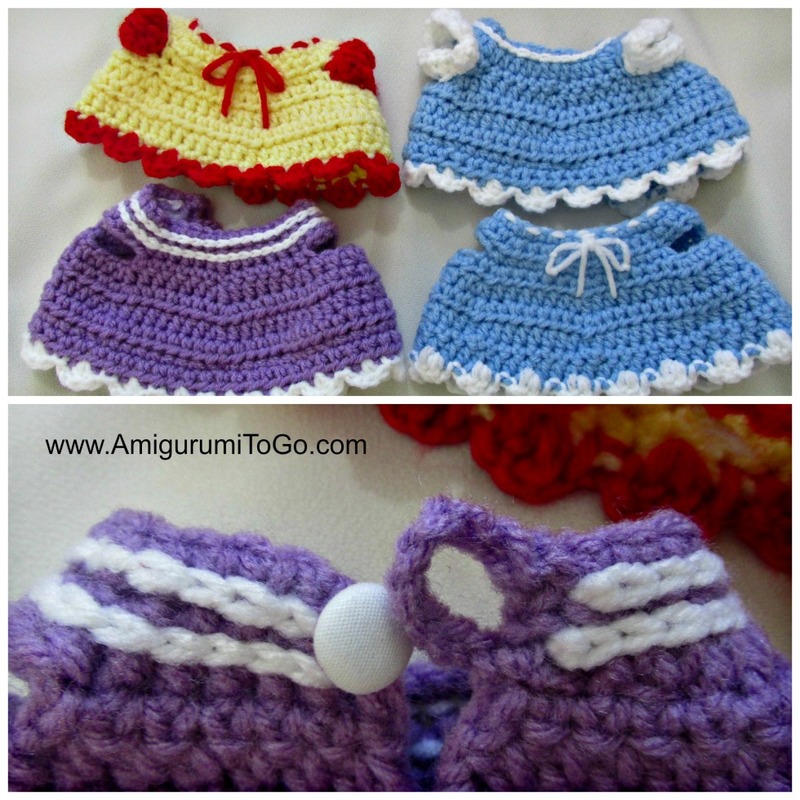 The pattern is the same for the dress and vest up to the end of row 8. * if making the vest then f/o and weave in yarn tail. 1) insert alternate color into a loop on the side of the sleeve hole, ch1 then 1hdc in the same loop. 1hdc in the next 7 loops. Then 1sc in the next 7 loops then sl st into the first hdc that started the row. 2) ch 2 then 2dc in the next st, sl st the next st, repeat this sequence 4 times. The 1hdc in the remaining stitches, sl st the very last st and f/o. Weave in yarn tails. 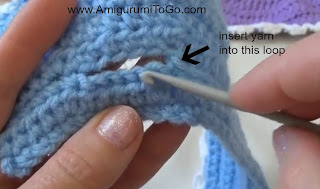 View video at 27:39 for the sleeve part of the tutorial if you have troubles following this written pattern. I show a couple different ways to decorate the dress and also how to add in the button loop in the back to close up the dress. Please view video for this part as it's too hard to explain in written form. Feel free to make the sleeve longer and play around with different stitches too! ACK...these are the cutest ever!!! Hi, I was just wondering if these dress patterns would work for you mice. Or would they be to big for them? Because I think your mice would look super cute in these dresses! no, sorry. The Dress Up Pigs are almost 11 inches tall. Later in the year I will be able to design more clothing. Hello Sharon! When I made my pig I used 2 strands of yarn. If I use 2 strands on the outfit will it fit my pig? I love your patterns and videos. I made Darcy with 2 strands of worsted yarn for my Great Nephew who is 3, he loved him. I don't know how to post pictures, when I do, I will post them on your FB. Thanks again for your wonderful patterns & Video's!! I'm sure that will work. I haven't used double strands for clothing myself but I'm pretty sure it would work up the same as amigurumi. Thanks. For your pig and their clothing patterns today I finished my pig and ut came out awesome!!! Hi Sharon!! Love your patterns so thank you so much!! Would like to know if these would work on the teddy bear crochet u had as well. The 4" ones cuz i made them but i want to make a small dress for it. Thank you! Hi Sharon, love your work :) simply amazing. Just wondering if these clothes will fit the (angel) bear. Haven't crocheted this pig yet so I can't visualize it side by side to measure. Thanks Sharon, God bless you. Your line of work is so inspiring and therapeutic. Thank you so much for these patterns. I loved making them. 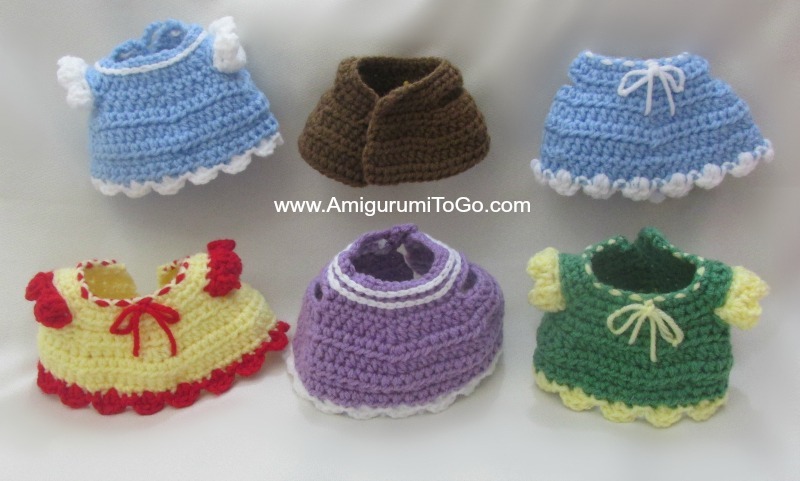 As I have been recovering from a broken foot, crocheting these items have made my healing process a lot easier. They are all so cool!! God bless you! Isn't there an error in line 4 where the stitch count should be 34 rather than 36. I have done this 4 times so far and have been off thinking that I have missed something. this is an old pattern, all the way back to 2014 so my memory of it is gone. I just looked and yes, there should be 34 but then that throws the rest of the stitch counts off.. I would have to look at the video again and see what I did there. My apologies, you are the first to catch that, the dress has been made many times over and there's never been a word about it. I am super busy atm so can't look at it right now.. I'll have to re-write the whole pattern. I can also see I chained 1 instead of 2 at the end of rows where there is hdc worked so not sure what to say about it until I get a chance to view the video. I was just figuring out clothing back then, not the best at clothing. My apologies again. I tried both of your patterns, the dress and the pig. This was my second amigurumi and I’m in love! Your extensive explanations and tutorials make this as easy as it gets! Thank you so much!